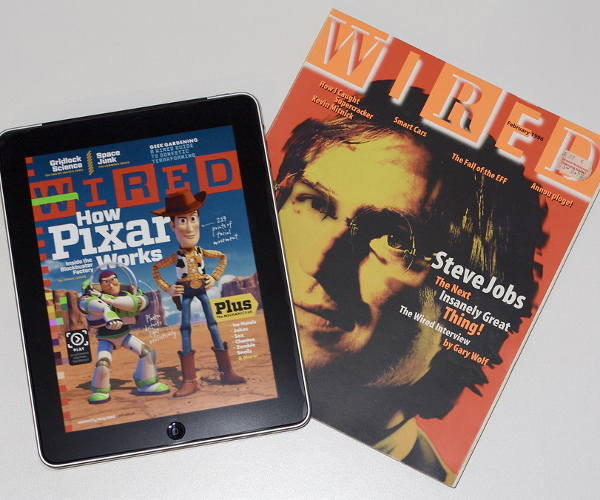 When Wired launched on the iPad, it come in for some deserved praise. Taking the popular print issue and adding interactive elements, vibrant colours and iPad specific navigation, Wired’s debut iPad issue sold 105,000 copies with 24,000 of those purchases being made in 24 hours. The magazine has enjoyed success both in print and digitally. WWD reports that Wired’s print edition is currently occupying top-spot at Conde Nast, has seen its ad pages increase by 24% with typical sales of around 83,000 on newsstands. Wired’s iPad sales figures have remained almost secret since launch, only coming to light at certain times of the year. Last month we reported that the Wired app sold 31,000 and 28,000 copies in July and August respectively, a significant dip since launch. Wired isn’t worried though, sales have progressively increased as iPad penetration grows, meaning that the Wired iPad app has levelled off to a figure of about 32,000 per issue, around 39% of print sales. As digital adoption increases, Wired is finding that developing its iPad application is requiring 20% extra resources than the print version, thanks largely to the inclusion of extra interactive elements and video clips. Wired editor Chris Anderson believes that the magazine will be able to decrease that amount down to around 10% as the magazine’s processes improve. On the horizon, Wired is looking to give its app a social overhaul, taking inspiration from the popular iPad social reader Flipboard. Anderson noted in an interview with Jon Lund, an Internet advertising expert based in Denmark: “We’ve got a proper social media layer coming into our app later this year”, he said. “I love Flipboard… and we’ll definitely be taking tips from them”. The addition of more social elements and the introduction of a separate UK iPad edition will most likely bring in new customers, its just a matter of keeping them.